The Mixed Lake at Cackle Hill Lakes, Biddenden. 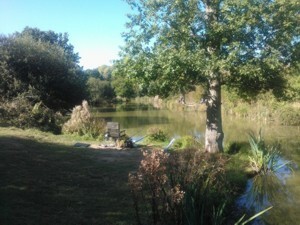 Being the smallest lake in the complex, the oldest lake should not be dismissed by anglers, indeed we have just restocked the water with Silver fish, tench, bream, chub, there are some lovely carp in double figures that still remain hidden in the murky depths along with the odd catfish. There are a limited number of swims on the lake and two of these are suitable to be fished as doubles. All of the lake fishes well with many captures coming from the middle as well as from the margins that are undercut. The depths vary from two foot to over eight foot and with the stream running through the lake the level very rarely goes down. Along with the netting which was carried out earlier this year, we have removed lots of the reeds and some of the overhanging brambles and foliage. This has resulted in more areas of the lake becoming fish-able for the first time since we brought the complex all off those years ago. The mixed lake is a very special place to fish – there is an abundance of wildlife to view including our resident kingfisher family. This lake is really worth a visit for a day or night session.